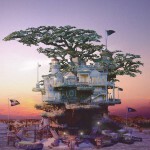 The Japanese art of growing bonsai trees is a great way to breathe life into the interior space. 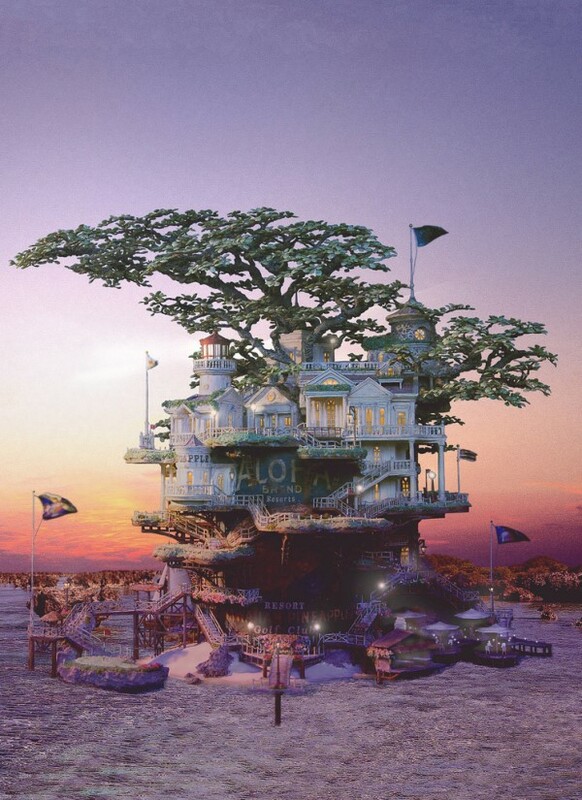 But the artist Takanori Aiba raised this art to a really new level. 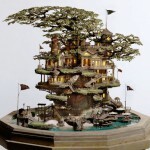 Japanese master creates complex miniature masterpieces, these architectural wonders, which are an integral part of dwarf trees. 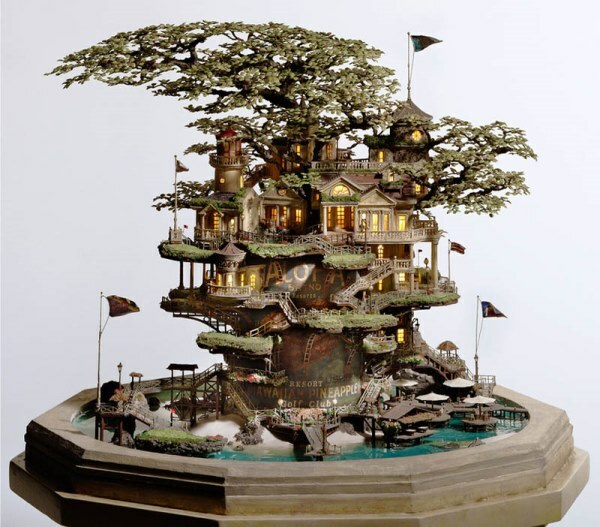 Growing tiny bonsai trees takes no less time than growing full-size deep-rooted trees, but Aiba creates so incredible buildings that it is felt as if the wind noise in the crowns of the trees. 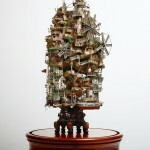 Using copper wire, epoxy putty, plastic, resin and clay limestone, he recreates the intricacies of buildings, bridges, balconies and towers. 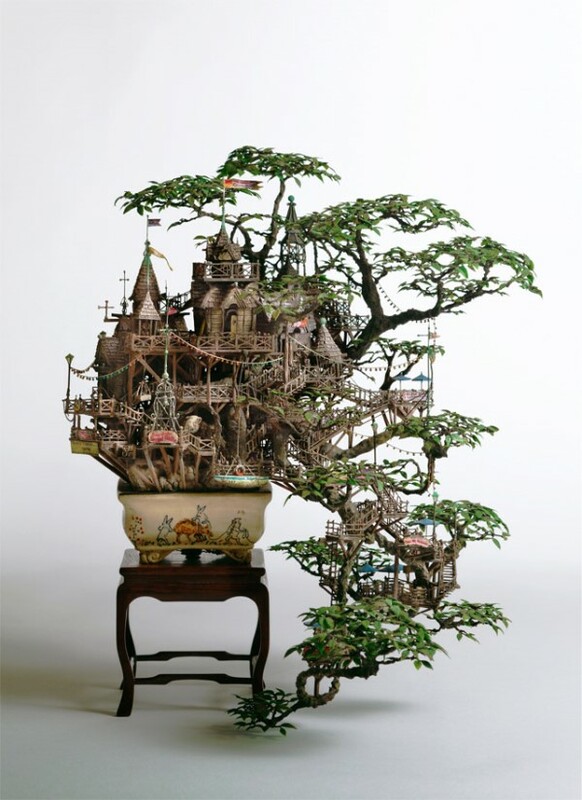 Bonsai trees are the basis of each composition, the design of which is based on the unique shape of each tree. 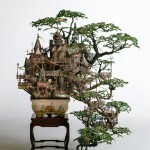 The first few miniature buildings made by Aiba, functioned as additional ornaments for bonsai. 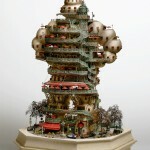 The constructions were located in the branches of trees, which fell down in cascades to the floor. 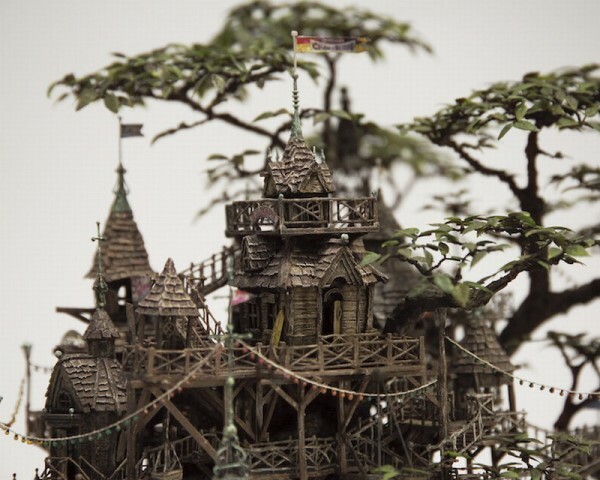 Each branch was adorned with terraces, umbrellas and tiny garlands, creating incredible miniature housing for fictional Swiss Family of Robinson. 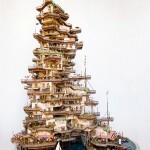 Subsequently reducing the number of branches, Aiba created more housing carved out of pineapple, and called the composition “Hawaiian Pineapple Resort”. 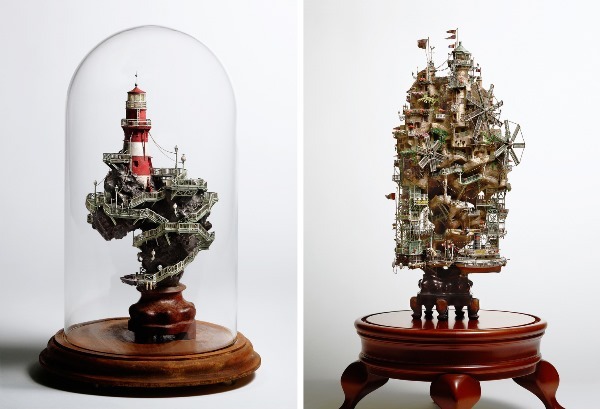 Tree houses turned into towering lighthouses, located high on the rocks, with wooden walkways leading them. Architectural experiments led Aiba to the creation of fancy Michelin hotel, which is made ​​of a stone figure of a man with the famous logo. 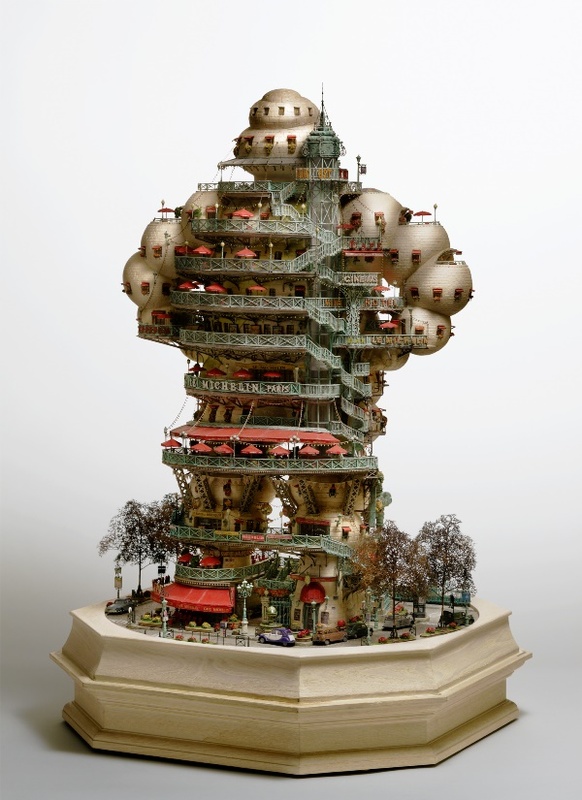 Windows are located at all over his body, and the abdomen and legs are formed by branches of the bonsai tree. At the feet of the man there are tiny Rolls Royces. Each bonsai composition is equipped with a beautiful fencing, and sometimes with a glass frame, which gives it a finished look. Tiny creatures are truly inspiring. 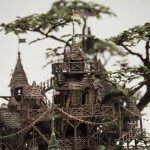 The art of growing bonsai here creatively intertwined with mastery of the artist. 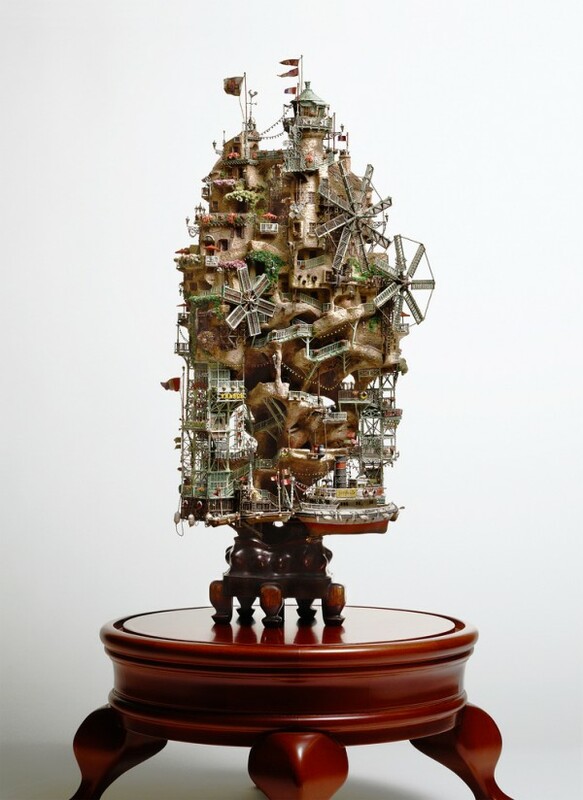 Takanori Aiba was born in 1953 in Japan. 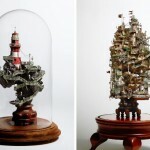 From the age of 25 he is working as a freelance illustrator. 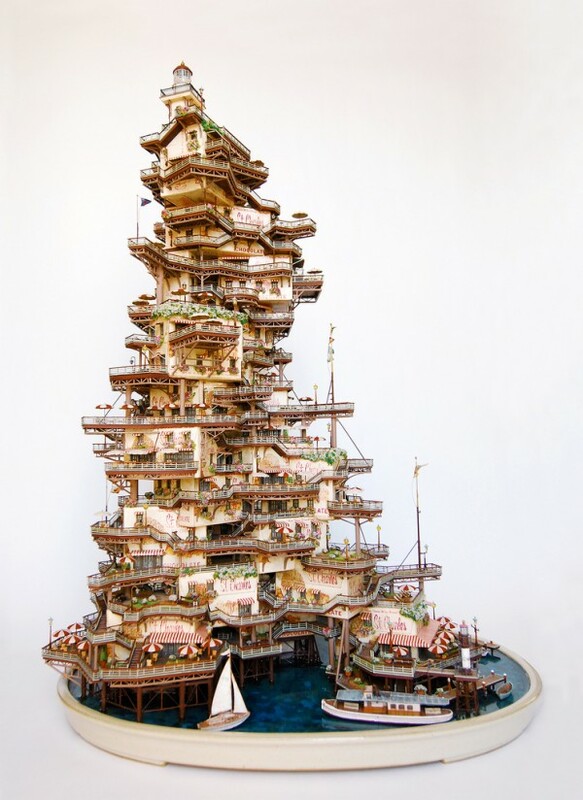 And when he was 50 years old, Takanori began to create extraordinarily complex and beautiful miniature compositions with elements of natural and urban landscapes with lots of tiny details.